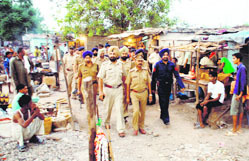 The Chandigarh police today placed Industrial Area police station SHO Jagir Singh along with four other policemen under suspension in connection with the custodial death of 35-year-old Inderjit Singh, who died under mysterious circumstances at the police station yesterday. 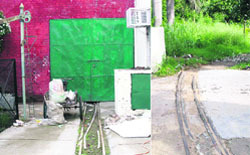 There will be a metro station at the Chandigarh railway station. Under the proposed mass rapid transit system (MRTS) for the city, the Chandigarh administration has written to the Northern Railway regarding the setting up of a station at the Chandigarh railway station. The Punjab government has decided not to extend the limits of the Nayagaon Notified Area Committee (NAC) to include the entire areas of Nadah and Karoran villages. 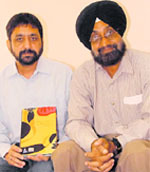 Rameshwar Prasad, in charge of judicial malkhana at Ropar courts in 2002, was today sentenced to three-year imprisonment by the court of ACJM Jaswinder Singh. He was also directed to pay a fine of Rs 5000. The moment the news flashed on the channels about the death of Ishmeet Singh, winner of Star Voice of India 2007, his fans started exchanging SMSes and there was great shock among them at the untimely and tragic death of their star. Ishmeet, an 18-year-old Ludhiyana lad, touched the heights of glory by winning the hearts of people by his melodious voice. The Chandigarh Administration has virtually shattered the dream of the Punjab government to construct its Finance and Planning Bhawan in Chandigarh. The Punjab Government had given Rs 14.98 crore to the UT Administration for allotting 2.58 acres of land for the bhawan in March 2007. However, sources in the state government said the land was allotted to the state at such a place in Sector 38 where it was difficult to take possession of the land. Fascinating is the word ambassador Danie’le Smadja, head of the Delegation of the European Commission in New Delhi, chooses to describe her Indian experience since she arrived in September last year. She’s quick to justify her choice of description for India. “It is not only fascinating for the varied hues splashed around on the Indian canvas, the rich cultural history, the interesting personalities but also for its movement towards ‘Incredible India’. Impressing upon the Indian Police Service (IPS) probationers the need to imbibe a value system, Punjab Governor and UT administrator Gen S.F. Rodrigues (retd) today asked them to develop qualities of head and heart, with the focus on character, commitment and courage. Taking cognisance of Monday’s incident in which four students of the department of Punjabi, PU, protested against their teacher, the PU Syndicate today constituted a committee to look into the matter. The Panjab University Syndicate at its meeting held today decided to give 10-day deadline to Homoeopathy College, Sector 26, to implement the agreement between the management and teachers over financial matters and promotions in the presence of the vice-chancellor failing which the university would start the disaffiliation process as per section 30 of the PU Act. Students of the UIET (University Institute of Engineering and Technology), PU, are once again in the limelight and once more for wrong reasons. In a recent incident of ragging in UIET, the standing committee of PU had suspended the students after listening to both parties. If teachers of Moti Ram School, Sector 27, here, who have been teaching for 20 years, are to be believed, they are being "terrified" by the school management. Parents of a Class II student today alleged that their son was beaten up by his class teacher yesterday. Tirlochan, a resident of Dadumajra, said, “My son Tarun Kumar, who studies in GMHS-38, was assaulted physically by his teacher, Naresh. Halkesh Ram, a resident of Muktsar, was sentenced to 10 years’ imprisonment and a fine of Rs 2 lakh was imposed on him by district and session judge Sanjeev Jindal today under the Narcotic Drugs and Psychotropic Substance Act 1985. For ensuring a clean Panchkula, the municipal council requires at least 800 safai karamcharis but financial constraints did not permit the local administration to induct so many persons - this is what the authorities concerned have to say on the conditions prevailing in the town. The Chandigarh police today formally arrested Jaswinder Singh Bhullar, alias Rocky, one of the prime suspects in the murder case of “gangster” Prabhjinder Singh Dimpy. He was produced before a local court, which remanded him in police custody till August 4, while his associate, Amandeep Singh, arrested under Arms Act with Rocky, was remanded in judicial custody. 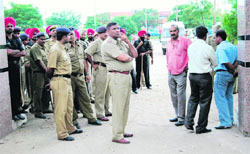 The Patiala Vigilance Bureau today arrested an assistant sub-inspector (ASI) when he was accepting a bribe of Rs 4,000. Former sarpanch of Khooni Majra village Kulwinder Singh and members of his family have been booked for assaulting the present sarpanch, Bhag Singh, his wife Labh Kaur and two sons. Residents of the town today observed a bandh in protest against the attack on newly elected council president Babla and vice-president Rinku allegedly by supporters of the Cheema group yesterday during the victory procession. Devraj, district Gram Udyog organiser, was held taking a bribe of Rs 500 today. Acting on the complaint of Om Pal, an employee of Khadi Gram Board, Ropar DSP (Vigilance) Banarsi Dass arrested the accused red- handed while taking bribe. In the Inter-School Badminton Championship, Sacred Heart Senior Secondary School, Sector 26 girls retained the title by defeating Stepping Stones, Sector 37. Manav Mangal High School, Sector 21 C, today clinched the under-14 girls’ title of the UT Inter-School Table Tennis Tournament held under the education department being played at DAV Public School, Sector 8. 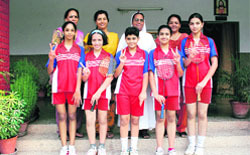 Manav Mangal girls bagged the title by beating the girls of Sacred Heart, Sector 26, by 3-1. DAV Public School, Sector 8, girls beat Bhavan Vidyalaya-27 for the third place. A resident of Panchkula alleged that her gold chain was snatched outside a showroom in Sector 5, here, this evening. The Mohali police today recovered the car that was used by the person who assaulted Tribune lensman Vicky Gharu near the Phase VIII apni mandi on Sunday evening. The Mohali police has booked a constable of the Punjab police for “loitering” following allegations that he was indulging in exhibitionism. Krishan Chand, a resident of Shimla, lodged a police complaint alleging that his bag containing cash went missing from his vehicle in Sector 9 here. City doctors in race for top AIIMS post? Who will be the next director of the All-India Institute of Medical Sciences (AIIMS)? The countdown began with the current occupant P Venugopal retiring on July 3. The selection process for appointing the new director will start tomorrow.